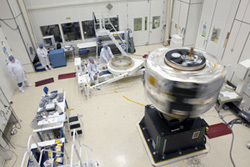 NASA’s RBSP spacecraft A, shown here in mid-September undergoing spin testing at the JHU Applied Physics Lab in Laurel, Md. RBSP A was spun from 30 RPM up to 85 RPM, in both clockwise and counterclockwise directions, so APL engineers could balance the spacecraft and precisely determine its center of gravity. NASA’s RBSP mission recently made another significant step forward toward its scheduled launch in August 2012, thanks to the successful testing of the mass properties of spacecraft A by the RBSP team at the Johns Hopkins Applied Physics Laboratory (APL). On Sept. 12, RBSP spacecraft A became the first APL-built spacecraft to be tested on the Lab’s new spin table. It underwent both a spin balance and mass properties test, two procedures that are done in concert, and in order, as they are intimately linked. First, the spin test reveals how the spacecraft is balanced – a crucial physical trait during the twin satellites’ launch, orbit insertion, and science operations around our planet. In a procedure very similar to that of balancing an automobile’s wheel and tire, the spacecraft is attached to a special spin table and spun at high speeds to help reveal imbalances that produce wobbles. As annoying as the wobbles can be on your car, they can be fatal to a satellite mission – but imbalances can be easily corrected by using small weights placed at precise places in the spinning body. 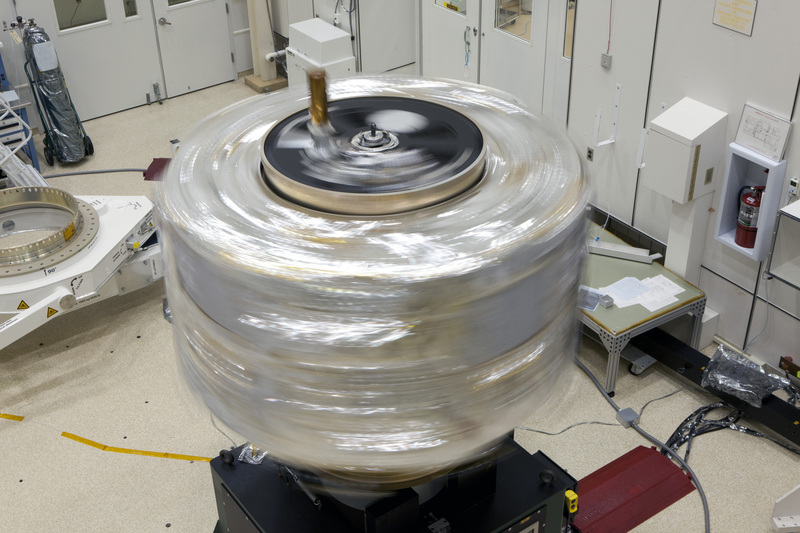 Though the nominal rate of spin for the RBSP spacecraft while collecting science data will be a leisurely five revolutions per minute (RPM), during testing the satellite was spun from 30 RPM up to 85 RPM, in increments, in both clockwise and counterclockwise directions. Dave Persons, lead structural engineer for the RBSP mission and head of the spin balance and mass properties test team, explains: “We spin at various speeds and in both directions to find out where air drag begins to affect the balance operation here on Earth. You want to spin the spacecraft as fast as you can to get the centrifugal forces very high, which gives the best data for the load sensor [which shows how the craft is balancing].” The fastest that RBSP will spin after entering orbit is about 15 RPM, when the spacecraft deploy their Electric Field and Waves (EFW) booms. Once spacecraft A was balanced, RBSP engineers began the mass properties test. This time, the spinning satellite was measured to determine its center of gravity and details as to its inertia about the main axes of operation. These are critical measurements for loading the launch vehicle and planning the RBSP’s separation maneuvers and science operations. 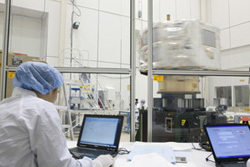 One particular balance challenge for the RBSP spacecraft designers is the ruggedness of the satellites’ systems. Since RBSP will be operating in the radiation belts that surround our planet, many of the electronics are protected by heavy lead cladding and shielding. “It made for some challenging modeling,” says Jim Stratton, mission systems engineer for RBSP at the Applied Physics Lab. However, some early work by RBSP engineers paid off with great data that alleviated some of the difficulty. In the wiring harness clean room, engineers used two full scale wooden spacecraft mock-ups to route and fit each of the flight harnesses. The RBSP engineers used these mockups for preliminary mass properties tests that provided a series of harness mass points. “That allowed our mechanical engineer to prepare much better models of the mass properties of the harness,” says Persons. Best of all, the testing was completed a day early (thanks in part to the accurate models), meaning that “we had to add less balance mass than we were prepared to,” Stratton said. 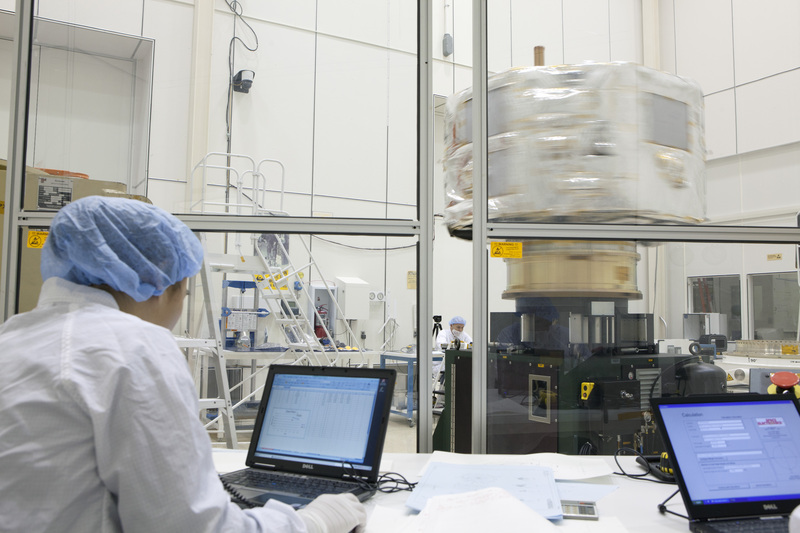 Because RBSP’s spacecraft are nearly identical, spin and mass properties testing of spacecraft B is not required at this time, and will take place after the two spacecraft complete environmental testing at APL. Both spacecraft will go through final spin and mass properties testing at Kennedy Space Center prior to being loaded onto the launch vehicle. APL manages the RBSP mission for NASA and will operate the spacecraft. Check back for more photos, videos and updates as the mission moves toward launch in August 2012.